The new black Aio handset showcases a stylish finish, coupled with Methven’s unique-style defining ‘halo’ shape that is designed to be the centrepiece in any bathroom. It is paired with the Krome 120mm Rail Shower, with adjustable mounting brackets for easy installation and introduces an unparalleled Aurajet® showering experience with a modern matte black aesthetic. This gorgeous matte black handset uses Methven’s award-winning patented Aurajet® technology. This technology uses invisible hidden nozzles to generate single jets of water that hit precisely-engineered surfaces. This handset produces a full-bodied spray with maximum contact for all-over warmth, creating an invigorating showering experience. 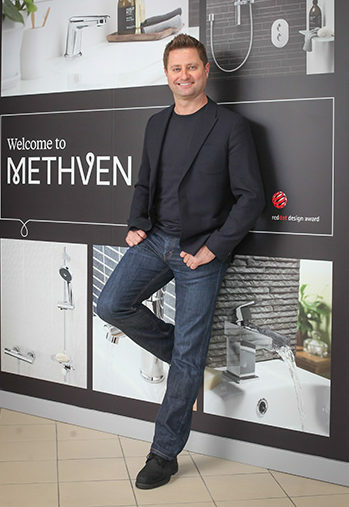 Compared to traditional showers, the matte black Aio shower delivers up to 20% more total spray force and double the water coverage on the skin– yet it only uses as little water as 9 litres per minute, continuing Methven’s commitment to savings on water and energy bills for consumers. The Aurajet® Aio Matte Black Rail Shower features Aurajet® technology, Ultra-wide coverage, is Limescale resistant, has a handset available in matte black, chrome and chrome & white finishes and is suitable for pressures above 1.0bar. 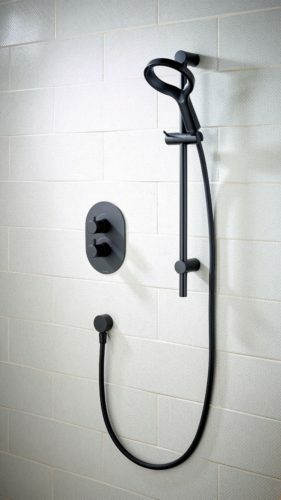 The RRP for the Aurajet® Aio Rail Shower in matte black is £271.20.